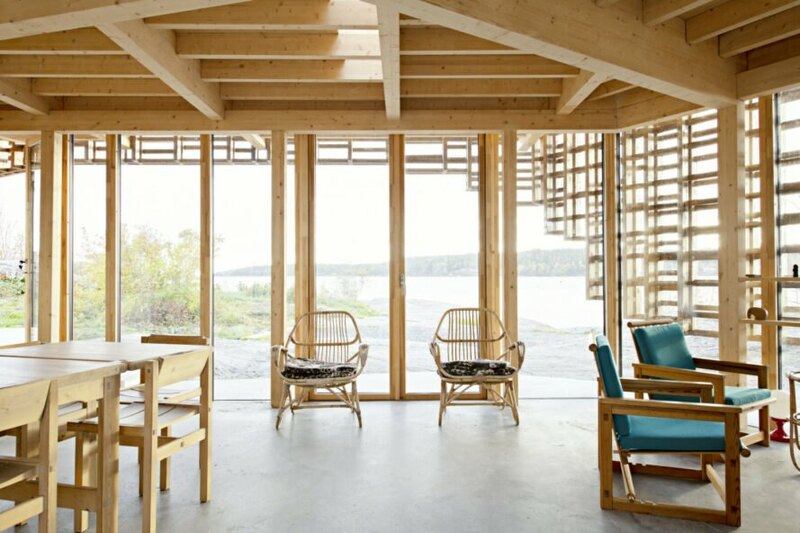 Oslo-based firm Atelier Oslo has created a beautiful home for a pair of artists who wanted to enjoy a peaceful retreat on the remote Norwegian island of Skåtøy. Built into the rocky landscape, the design for the House on an Island was inspired by the couple’s desire to find a place for contemplation in nature. The 7,500-square-foot glass cube features a prefabricated timber frame enveloped by a loosely gridded timber facade that filters the sunlight into playful shadows throughout the interior, emitting the calming feeling of sitting under a swaying tree. The home was built on a rugged landscape characterized by smooth and curved rocks that run down to the coastline. 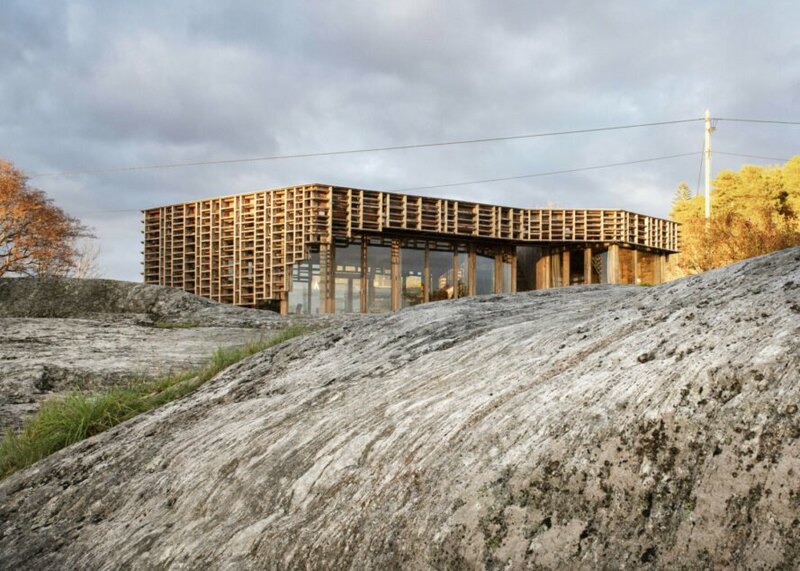 Although the rocky terrain was challenging, the architects managed to use it to their advantage. Using the large rocks as a base, the architects laid a concrete foundation that wraps around the rocks to mark the home’s layout, resulting in various split-levels that follow the contour of the natural topography. Built on a slight knoll, the home’s frame is made out of prefabricated timber. The main volume is a cube-like shape comprised of massive glass panels partially covered with a timber “netting.” The timber panels, which were made from heat-treated wood that will turn gray over time, covers the rooftop and drops down over the front facade. This system allowed the architects to truly embed the home into its natural surroundings. The timber slats are placed far apart, allowing filtered natural light and playful shadows to emit a calming atmosphere throughout the interior. The living space of the two-bedroom home is an open layout with modern furnishings. Again, using the home’s natural materials to enhance the atmosphere, Atelier Oslo emphasized natural wood and concrete for the interior design. Exposed wooden beams run the length of the ceilings, and concrete flooring gives the space a fun, industrial feel. Concrete was also used to craft an impressive fireplace and adjacent stairwell (which doubles as a bookcase) that leads to the top floor. 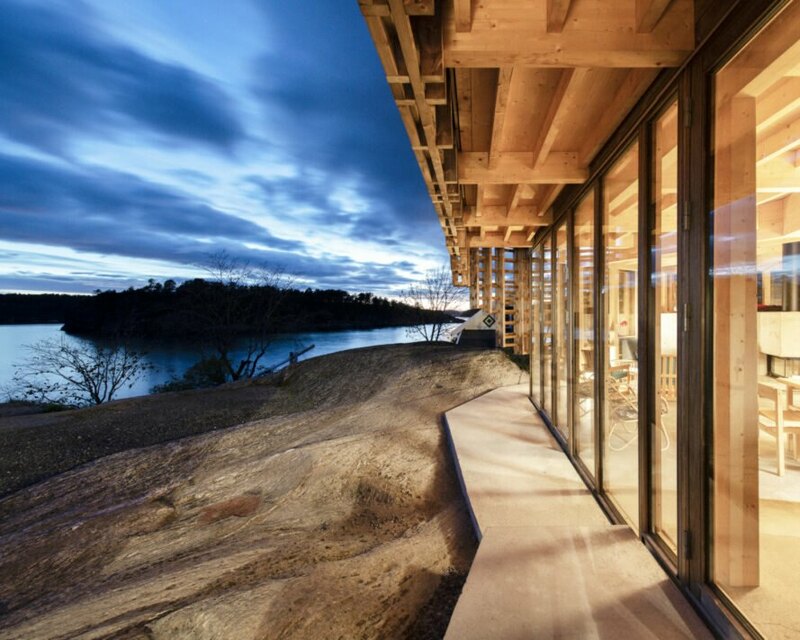 House on an Island was designed by Atelier Oslo. The home is clad in prefabricated timber. 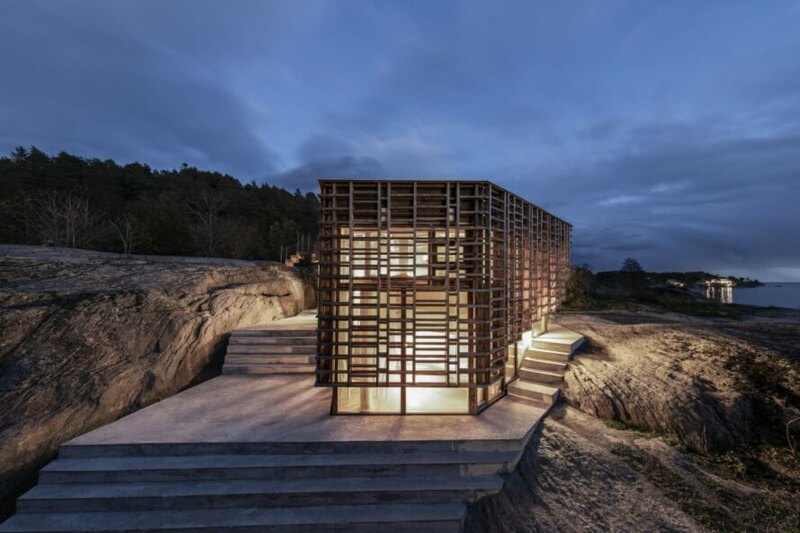 Located off the coast of Skåtøy, Norway, the home was designed for a pair of artists. 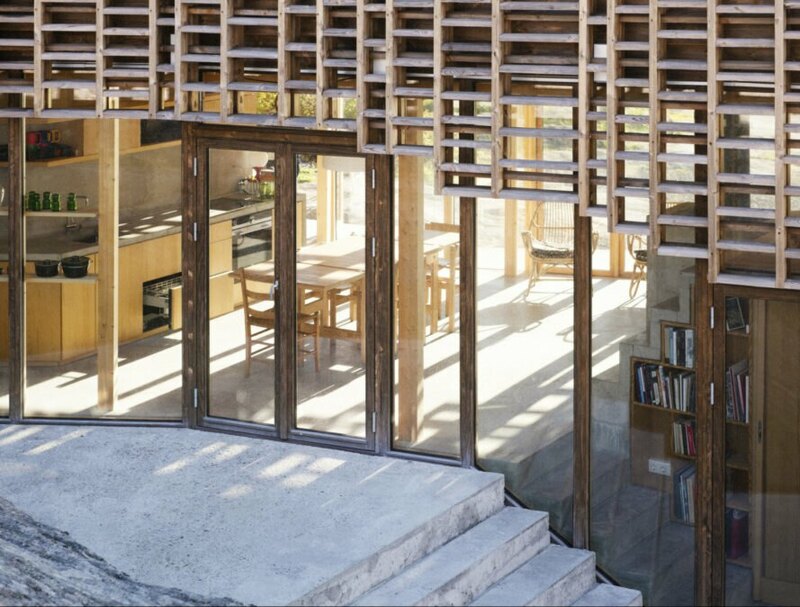 The stunning home's timber facade frame is embedded into a concrete base. With the widely-spaced timber cladding, natural light streams through the interior. The interior space is an open layout. 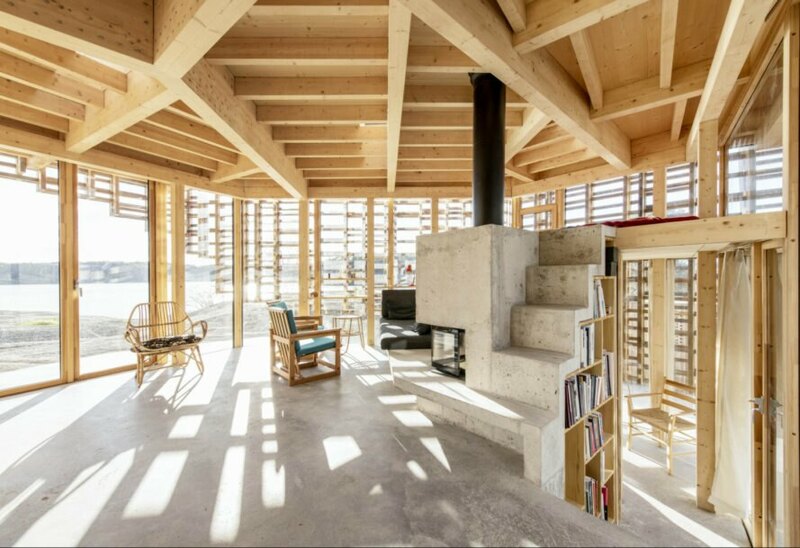 Timber and concrete were also used as the primary interior design materials. The interior design scheme is minimal, putting the focus on the stunning views. Playful shadows dance across each room. The interior spaces are light and airy. The home is strategically embedded into the rocky topography. A wide overhang sweeps over the home, providing shade from the sunlight. Timber slats give the home movement. A model of House on an Island.